Since the next trip location and route have been decided I thought I'd make a start on the necessary arsing about, getting a few things ready. The Big Agnes gets her second outing but this time she will house both Paul and I and so I had to make an important addition to the tent bag – a footprint. I knew when I bought the Seedhouse SL2 I would eventually need a footprint as the groundsheet isn't thin its almost molecular! On the Coniston trip I found a great pitch and since it was being used solo I wasn't so worried. This time however, with two of us in it, I don't want to risk a hole or a tear so yesterday after painting the hall (oh the glamour) I set about making my own lightweight footprint. 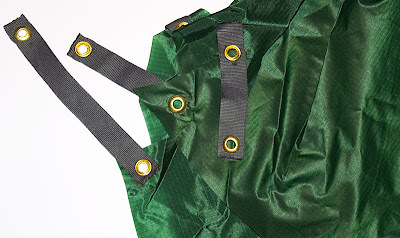 I ordered some 70gsm waterproof rip-stop nylon from Penine Outdoors and aside from it being a gopping green is perfect the job. I set about marking the outline of the tent by simply drawing around it and then cut inside the line by around an inch. I then just measured 4 lengths of webbing strap and set about attaching eyelets to insert the tent poles into. Now I have a fully secured footprint which packs down really small and the whole thing only adds 145g to the weight. I doubt I'd need this so much when going solo but, given that Paul and I are sharing the load of the tent, this is a small price to pay for the extra protection. Those who read the post below might be interested to know that I am now the owner (although it is yet to arrive) of a 665g Cumulus Quantum sleeping bag. This is going to make such a huge difference to my pack in terms of weight and bulk. This purchase alone has saved me 1185g and enough space in the pack for a few extra layers, more food, or just a less bulky pack. One other trial I had to perform was in relation to the Icon-X emergency charger. I have been using the Nokia N82 for a month or so now but I have never tried to charge it from flat using this new technique. I'm glad I did try this before using in the field because I have found that a standard 1.5v AA battery does not have enough grunt to instigate a charge cycle. It must just be that the charging circuit in the phone needs more voltage input to get the thing going because if the phone has any charge in it when I plug it in to the emergency charger, it will happily charge away. I can get over this by making sure I don't let it run flat and charge it before the phone turns off. Moreover, I have also found that rechargeable Ni-MH do actually work and seem to deposit more charge than a standard alkaline battery. I think the perfect combo is going to be a standard Alkaline to kick off a charge and the rechargeable to give it a boost. Glad I have the sad side that made me check this now. “There's a good geek”! Clever that ground sheet - and light in design. Duncan (Akto Man) uses one of them bags. He gives it high praise on his blog and when I asked him. His is the 350 what is yours? Hi Martin - 1.45 on a school night! It could be a little lighter but I wanted it to be durable and to be able to secure it to the tent poles. That's great news about Duncan as although I found good reviews, there just aren't many owners out there. Mine is the 350 too. Nice lightweight solution. If you dont do this already put you mat between the groundsheet and the ground - I've always done this and never needed a footprint.